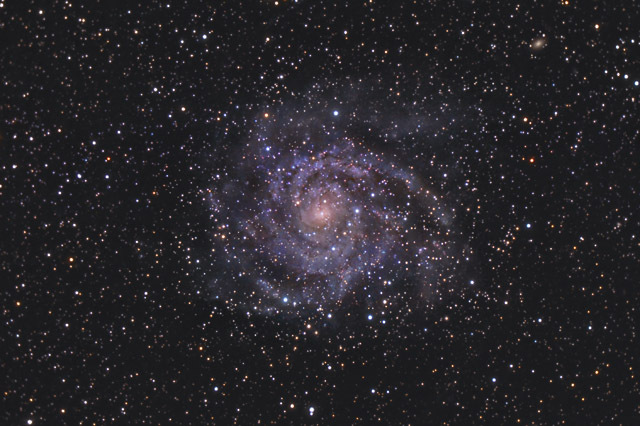 IC 342 is an interesting spiral galaxy that is also known as Caldwell 5. The galaxy is located very close to our galaxy's galactic plane. This means that we are looking through much of our own galaxy to see this much more distant galaxy. Because of this, IC 342 is partially obscured by our galaxy's interstellar material. For this reason, it is often called the "Hidden Galaxy". As far as galaxies are concerned, IC 342 is fairly close to us - it is one of the dominant members of a galactic cluster that is very close to our Local Group. Because of its relative proximity, IC 342 would be one of the brightest galaxies in the sky if it were located farther away from the Milky Way's galactic plane. IC 342 has a large apparent size in the sky - it is about 20 minute in diameter (about 2/3 this size of a full moon). 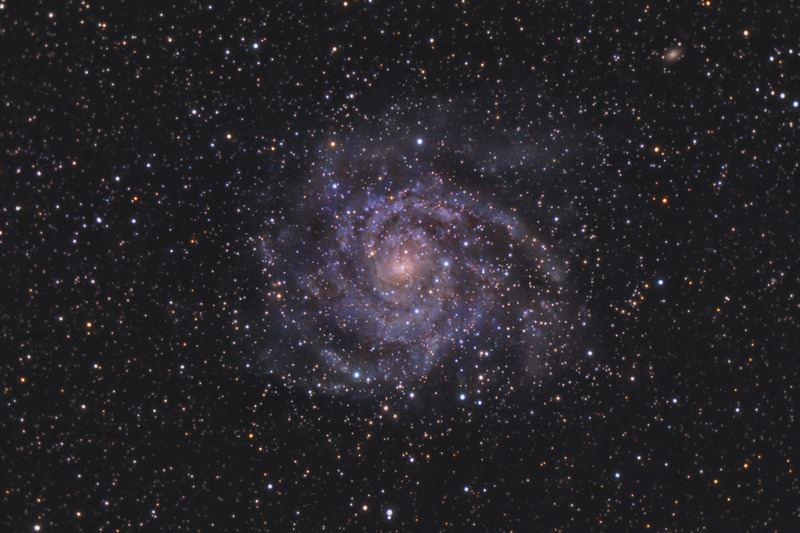 Due to its large size and obscuration from the Milky Way, IC 342 has a VERY low surface brightness. This makes it a quite challenging object to photograph. In this image, North is Up. This image is cropped to 84% of the original full frame. Notes This is a reprocess of an earlier version of this image using my DSLR-LLRGB workflow which allowed me to stretch the thin data more aggressively while keeping the chromatic noise to a relative minimum. Most photos of this object tend to show it as fairly pink in color. This is primarily due to interstellar material absorbing light from the distant galaxy. In this image, I've intentionally made the galaxy's color more blue. This represents what the galaxy would probably look like if it was located in the sky farther away from the Milky Way's galactic plane (plus I think it looks better!). This image was published by Astronomy Magazine as its Picture of the Day for January 3, 2013 (my 4th! ).